The Bearded Collie is another of the dog herding breed which was once used by the Scottish shepherds however its working days are now over and it has been retired to a family pet status. These dogs weigh a maximum of 60 pounds and stand approximately 22 inches high making them idea as a pet. Out of 155 different popular breeds of dogs in America the Bearded Collie has been ranked at 104 on the list. These animals make excellent pets but one must keep in mind that they are a high energy dog and requires activities to keep it occupied. With its long hair it must receive continual grooming to keep it clean, healthy and attractive. There is no question that a weekly brushing of its coat is absolutely necessary in order to prevent matting. Since the collie were originally developed as a sheep dog they naturally have a high energy level and could very likely get into a lot of trouble if this energy is not channel by some sort of activities such as playing games or performing tricks. The Bearded Collies are loyal and make great pets for children. Upkeep on these animals is great. The hair itself is difficult to wash since it is exceptionally long and brushing must be continuously accomplished to keep the hair looking as it should look. If you are searching for an obedient dog you might wish to consider the male collies as the females are rather bullish and do not like to take instructions very well. In the past these dogs were employed to herd cattle and sheep in Scotland where they originated from. They were a reliable dog that could withstand varied extremes in conditions and still manage to complete their tasks. These dogs are popular exports to both Australia and to the United States mostly as pets and not so much as a working dog. 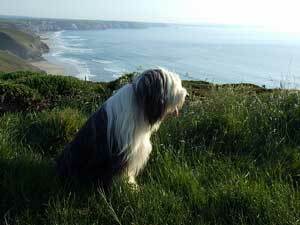 The life expectancy of the Bearded Collies is generally 12 to 13 years which is about normal for most dogs. The main causes of death in these dogs are old age, kidney disease and cancer. Vets generally report that the common health issue that is experienced by this breed of dog is musculoskeletal which would be arthritic in nature. Many tales have been woven around this breed of dog and it is often extremely difficult to separate truth from fiction. Tales of its initial introduction range from that of a traveling merchant who brought the dogs to Scotland all the way to the inspiring work performed by a Mrs. G. Olive Willison when she allegedly began breeding the popular dog breed.